I can’t grow brassicas to save my life but I love eating them. I don’t think I’ve met a brassica I don’t like. Happily they are also super good for you. I grew up in a household which didn’t eat much cabbage – which means that at least one of my parents doesn’t like it. That’s a shame, because, in addition to being much loved by those enjoying cabbage soup diets, cabbage is rich in all sorts of nutritional goodies, such as beta carotene, vitamin C and, of course, fibre. It will also provide you with a few B group vitamins and plenty of trace minerals. My cabbage recipe shows you how to turn the humble white cabbage into a tasty side dish (that’s if you don’t like eating it raw, which I do). Having just eaten the leftovers as a snack, I can also vouch for it cold! White cabbage is also insanely cheap at the moment – I picked up the quarter I used in this dish for just $1. Begin by heating a small amount of olive oil in a large frying pan – preferably one for which you have a lid. Add two rashers of bacon, chopped into reasonable, yet still bite sized, pieces. 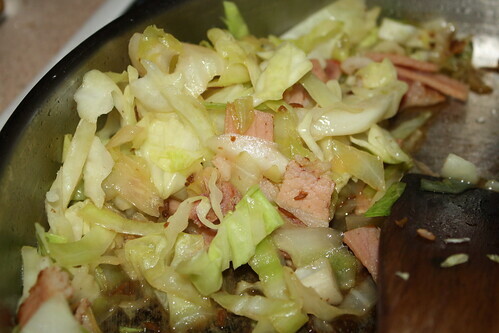 Fry the bacon – there’s not much point in letting it get crispy because you are effectively going to steam the cabbage – so just fry it off until it just starts to catch in the pan. Add a teaspoon of caraway seeds* and fry for 30 seconds or so before adding a quarter of a white cabbage, finely shredded. There will probably be a couple of very thick pieces of cabbage – I take those out (and eat them) because they take just a little too long to soften. Now add a splash of water, scrape up the bacon (and any tasty brown bits on the pan), turn the cabbage over a couple of times and then cover to allow the cabbage to steam. Don’t allow it to cook for too long – you don’t want it all mushy and lifeless. Serve with, well, whatever you fancy really. I’d eat it by itself, most recently we had it pork chops. * Technically they are fruits. If you haven’t used caraway before, it is quite strongly anise flavoured (and scented) so consider starting with half a teaspoon if that’s not normally your thing. I love cabbage! It is so underrated, as are Brussels Sprouts. I have a couple of mini cabb’s in my vegie garden, they take forever to grow but it is so rewarding knowing the work that went in to getting them to the table. I hope you don’t mind me posting a link to one of my recipes here but I just love this way of preparing it so much that I jump at the chance to share it with as many people as possible. Ah for Brussels Sprouts you need to try Fino’s! They are very lightly cooked and served with puy lentils and warm chevre & they’re absolutely gorgeous. Some friends who claimed not to have eaten brussels sprouts for something like 25 years even enjoyed them. And I will have to try out your cabbage recipe, if only because I have some much underutilised asafoetida sitting in a drawer! OOh yum, that sounds amazing. I have heard lots of good things about that place, must get down there.